The bulk of the most visually stunning props and costume components in the auction, according to the catalog, were “created from molds taken from the original hero prop and… hand-painted and weathered by the skilled craftsman at Weta Workshop during the production of The Lord of the Rings.” The descriptions of many also state “This prop was part of a collection of authentic production-created movie props procured by official New Line Cinema licensee, United Cutlery directly from Weta Workshop and Three Foot Six Productions between 1999-2004 for reference in producing a collectible replica version for fans of the film franchise.” In other words, the props and costumes were made by the Weta Workshop, but from the catalog it is difficult to know whether they are production-made replicas or could be something else. 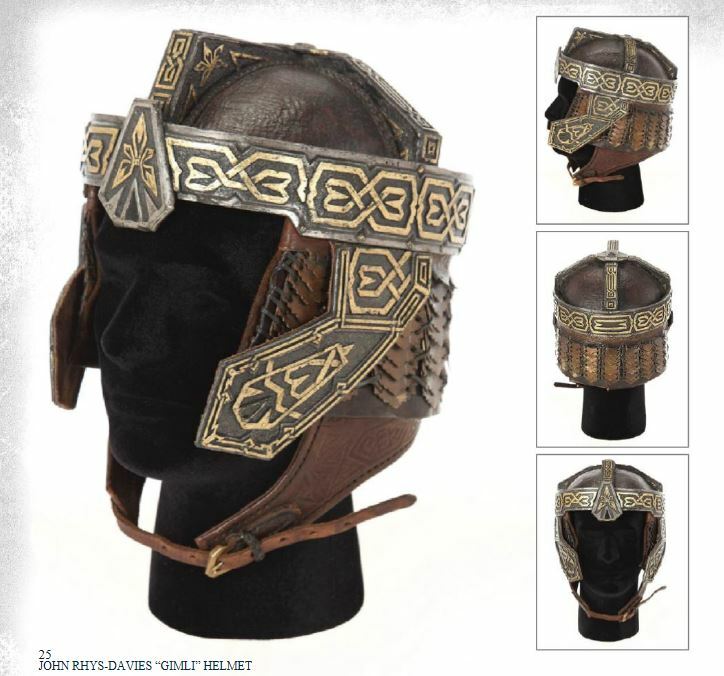 So buyer beware–if you decide to bid on any of the following, do your own research and bid with the knowledge that it is not known for certain whether any of the actors listed likely ever handled these items, and whether any were actually used on-screen and in what capacity: John Rhys-Davies’ Gimli’s helmet (expected to sell for $40,000 to $60,000), the High Elven Warrior Helmet ($15,000-$25,000), King Elendil’s helmet ($10,000-$15,000), the Shards of Narsil ($25,000-$50,000), Christopher Lee’s Saruman’s wizard staff ($40,000-$60,000), Sean Bean’s Boromir sword and scabbard ($15,000-$25,000), Bernard Hill’s King Théoden sword ($8,000-$12,000), the Witchking crown ($12,000-$20,000), Ringwraith Nazgul sword ($20,000-$40,000), David Wenham’s Faramir helmet ($10,000-$15,000), Faramir’s sword ($15,000-$25,000), Ian McKellen’s Gandalf the White wizard staff ($50,000-$70,000), Witchking warmask ($30,000-$50,000), Sauron’s helmet ($40,000-$60,000), and Sauron’s gauntlet ($25,000-$50,000). 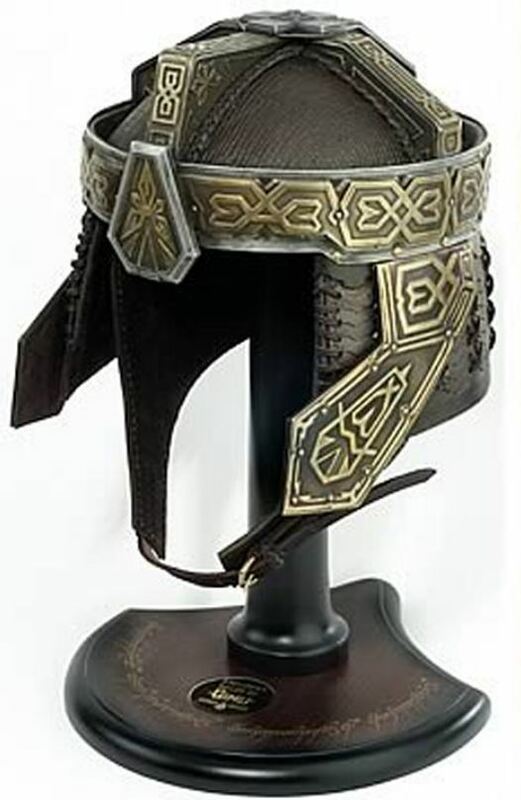 Replica Gimli helmet produced by United Cutlery from the production-made Gimli helmet in Julien’s auction, selling on eBay for $350. Are these auction estimates simply too high if these are only production-made replicas? In comparison, production-made replicas for various Star Trek TV series and movies might sell for $1,000 apiece today. The replicas that Weta made from the above pieces molded from The Lord of the Rings props stated above still sell in the neighborhood of only $1,000 or even less in the aftermarket. However, if the pieces are indeed stunt or hero pieces, then a higher auction estimate is certainly warranted. 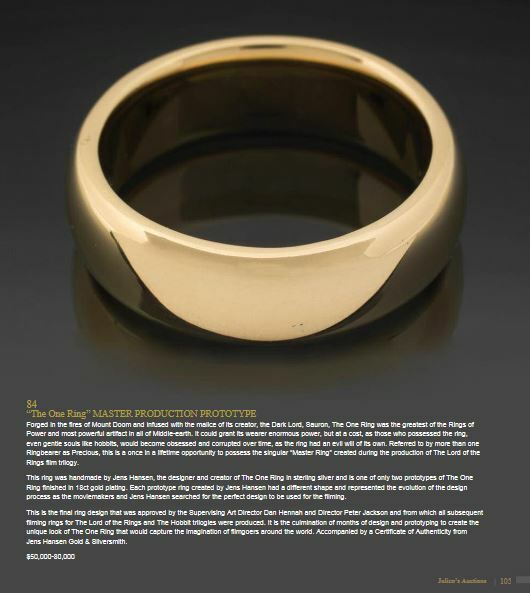 Other items at auction are several Hobbit ears and prosthetic feet, some Weta-designed life-sized displays that incorporate stunt and hero costume elements, filming miniatures, minor weaponry, and nine prototypes of “the One Ring”–including the final design master that is expected to sell between $50,000 and $80,000, with the rest of the rings estimated at $10,000 to $20,000. Unfortunately the rings include no script-inscribed text, but fortunately they also come with no dark powers. 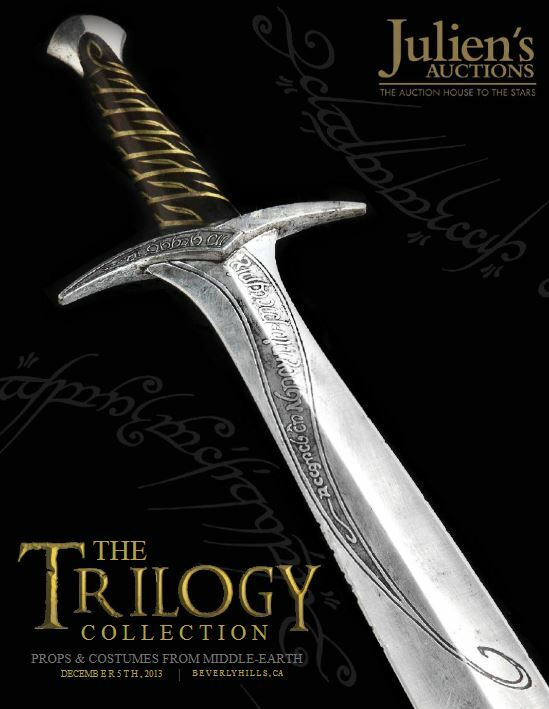 Julien’s “The Trilogy Collection–Props and Costumes from Middle-Earth” auction takes place Thursday, December 5, 2013, and more details are available at their website. The catalog is available for $60 including shipping and an online flipbook version is available at the auction house website. EDITOR’s UPDATE: We received a detailed response from the auction consigner and updated the article above at his request. 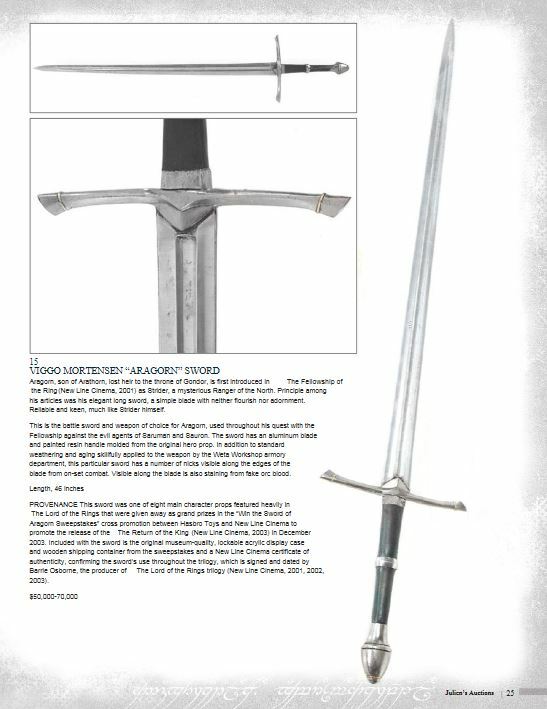 As happens many times, auction companies don’t fully explain in their catalogs all they could about the provenance of an item. Usually it is promising too much. This may be a different case here. We stand by the article as originally written based on the plain language of the auction catalog, which gave viewers reason to believe that many of the props and costumes were, at best, production-made replicas. We encourage potential bidders (1) to do their own research, and (2) contact the auction house or consigner directly with any questions before bidding. Thanks to consigner Troika Brodsky for supplying his response.